New feature of vertical analysis of testing results, introduced in TestGold 2.4, is Answer Analysis. 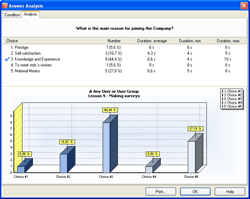 You select the test, the question and, probably, specify limitation by user group or session date and get bar chart and summary matrix with all information you need for every choice: voice number, minimum time, average time, maximum time. Now, you can make survey analysis or evaluate validity of used questions – pay attention to the right choices with lowest (less than 20%) or highest (more than 90%) number of voices or prevailing wrong choice. TestGold is the modern technology for pre-employment screening, training and periodical certifications – from visual development of psychological tests, assessments and surveys to testing and monitoring scores both on network and local computers. Complex test format, powerful built-in text editor, flexible scoring, opportunity to store data in power database servers, special freeware light-weight agent for testing make TestGold very powerful and cost-effective solution. Security hole fixed – user could set system time and get time profit during testing, limited by time.